Many people are aware of the advantages of a vegan diet, but are hesitant about becoming vegan because of concerns about the potentially restrictive nature of the diet. Vegans do not eat any animal products (including fish) or animal by-products. A vegan diet, though, is not just restricted to a few boring vegetables or tasteless lentils. A rich variety of foods are part of a vegan lifestyle. While both vegetarians and vegans do not eat meat, poultry, or fish, the main difference between the two diets is that vegans do not eat any animal by-products. 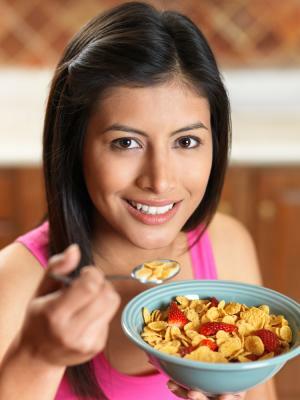 This includes all dairy, eggs, and foods that may contain animal products such as gelatin. However, a vegan can eat a wide and varied diet using natural foods such as grains, seeds, pulses, nuts, and vegetables. In addition to these, there are a number of other interesting and varied products suitable for vegans. These add a range of exciting and healthy possibilities to a vegan diet. Tofu is created much in the same way as dairy cheese. Soy milk is curdled, and the curds made tofu. It is naturally high in protein, low in carbohydrates, and very low in fat. Vegans use soy milk and yogurt as alternatives to dairy products. Soy milk is widely available in stores, and it's also relatively straightforward to make at home. You can also buy soy milk in powdered form if you only use it in small quantities. TVP, or textured vegetable protein, is a manufactured product that is formed into shapes that mimic typical shapes of meat, for instance ground 'mince' and larger chunks. TVP is dehydrated and then rehydrated and added to sauces or other ingredients. Tempeh is made from fermented soy beans. While this is not an attractive description, the end result is a tasty and 'nutty' textured treat. Stores often sell tempeh sliced, and you can eat it as it is, fry it and serve it 'burger style,' or chop it into smaller pieces and use it in traditional recipes as a substitute for meat. Tempeh is simple to make at home using a starter culture and cooked soy beans. seitan can be purchased ready made or made at home. It is made from wheat gluten, which is basically flour with the carbohydrate removed. This leaves the gluten, which is what gives flour its 'stretch'. When mixed with water, gluten assumes a soft, rubbery texture which is perfect for making into a variety of vegan products. The gluten is flavored and boiled. Some people cook the seitan in flavored stock to give it taste; others flavor the gluten before cooking or use a mix of the two methods. You can use the finished seitan as an ingredient in other dishes, or you can fry or roast it or eat it straight from the pan. Quinoa is a super grain has a nutty flavor. It is high in protein and is delicious sprouted or cooked as is. 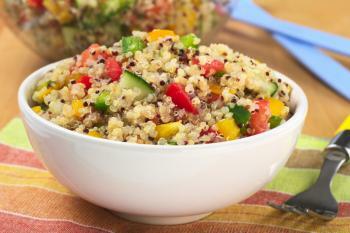 You can use quinoa in salads or as a rice-like side dish. Millet is a grain that comes from Asian grasses. It is rich in B vitamins, and works well in salads and hot grain side dishes. Many processed foods you find at the grocery store contain no animal products and are, therefore, vegan. These include the following. Checking labels quickly becomes second nature to a vegan to avoid potential pitfalls. Many vegan foods are derived from soy beans. Vegans may want to establish whether the soy beans have come from a non GM (genetically modified) source. Genetically modified foods, and the issues surrounding them, are often a concern for vegans and people interested in green living. There are many resources to help you find vegan foods. The Vegan Food Plate - A good source to ensure your Vegan diet is on track is the Vegan Food Plate. This plate suggests daily servings of vitamins, soy milk, vegetables, grains, beans, and fruit. In addition, check out their For the Earth tab for lots of information on how to be the best Vegan. The Boston Vegan Association - If you need a clear explanation on reading ingredients to stick to your vegan diet, visit the Boston Vegan. They offer great examples and information on how to read ingredient lists including how to identify sub-ingredients. Vegan Outreach - If you don't want to think about ideas for breakfast, lunch, dinner, and snacks for your vegan diet, check out the Vegan Outreach. They offer ideas for each meal to keep you on track. The Vegetarian Resource Group - Need more protein in your diet? The Vegan Resource Group offers ideas on how to achieve your proteins while remaining truly vegan! For many, the vegan diet is about more than food. It is a conscious lifestyle choice that minimizes animal cruelty while maximizing health. It can also be a highly satisfying way to eat, filled with natural and delicious foods.